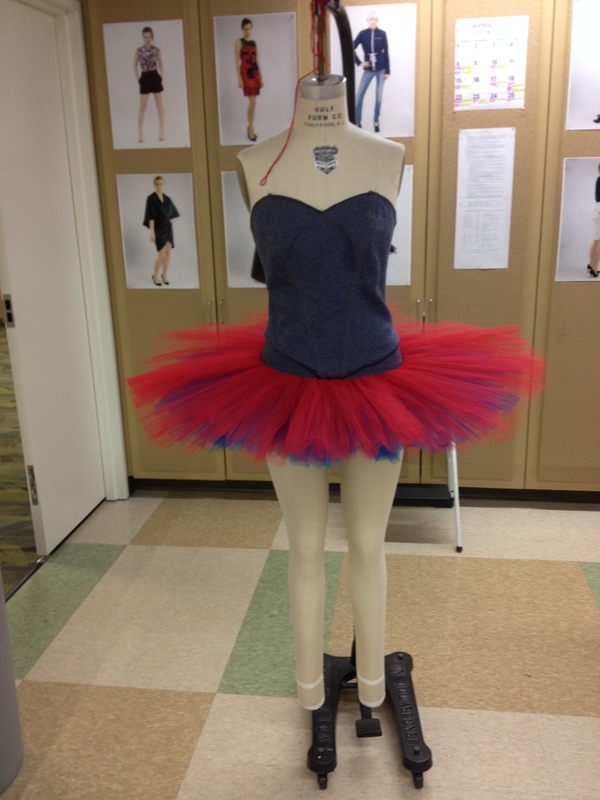 I dusted off my original denim test-tutu last week and did a little work on it, mostly because I was doing a talk on denim for the Chicago Haute Couture Club (that’s not intimidating) and I thought I ought to bring samples to show some of the awesome properties of denim. 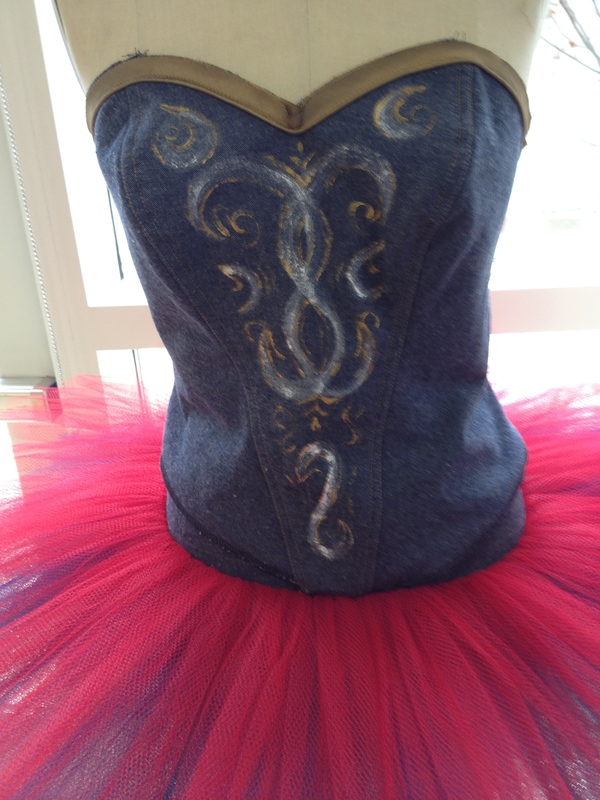 And, you know, if you happen to have a denim tutu lying around, that seems like the right audience. It’s help up surprisingly well to a nearly a year of being randomly tossed around/buried in the garage. There’s no boning in the bodice – it’s supported by the seams. 4 layers of denim in a fakey-welt is a fair amount of structure. I’ve been a little stumped about where to go design-wise with the bodice, but I decided to embrace the denim and do a riff on those uber-deced-out back jeans pockets. It works pretty well with the general highly decorative nature of ballet bodices. A couple minutes of festivity with some white and gold acrylics, and I have a base design that I’ll be adding studs and rivets to. In other denim news… Did you know there’s a painter from 1650ish know as the Master of Denim? No joke. Jean and Denim type fabrics have been working-class fabrics for a very long time. And denim has frayed out exactly like we’re used to seeing now since then. There’s actually some evidence that it’s appropriate to the late 1500s (if you’re a Genoese sailor), but before you think thoughts about making yourself a denim peasant costume, take a very good look at these pictures. That little boy in the jeans jacket? That’s the problem. The first thing you see is a jeans jacket, rather than a 1650 style coat that happens to be made out of denim. Our association with denim is far to strongly rooted in our concept of modern times.